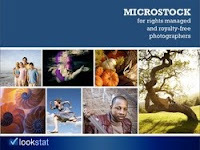 LookStat, a microstock keywording, retouching, uploading and analytics web platform provider released a free guide to microstock photography for rights managed and royalty free photographers. The guide contains details on how to establish accounts, submission requirements and profiles of the top microstock agencies. You can sign up at LookStat to get the free guide emailed to you.